Note: If you installed the VIB on an ESXi 6.0 system and you plan to upgrade to ESXi 6.5, make sure you uninstall the VIB before installing the 6.5 VIB. Step 3 - Reboot the ESXi host for the changes to go into effect. Step 4 - Extract the VMware-pyVpx-6.5.0-4602587.zip onto a system that has Python running. Step 5 - Move the learnswitch_cfg.py into the pyVpx directory that was created from the previous step and then change into pyVpx directory. Step 6 - Finally, we just need to enable the Learnswitch on the Distributed Portgroup(s) that we plan to use for our Nested ESXi workloads. To do so, we need to first edit the learnswitch_cfg.py and update it with our vCenter Server credentials along with specifying the list of Distributed Portgroup(s) we want enabled. Look for the following section shown below and update it with your own environment configuration. Once you have saved your changes. Run the script with the "add" option and specify the Hostname/IP Address of your vCenter Server, the name of the Distributed Virtual Switch and the IP Address of your ESXi host (do not use hostname). Note: If you have more than one ESXi host, you will need to run this script for each of the ESXi hosts. At this point, you have now successfully installed and configured the new Learnswitch module. You can start deploying and running your Nested ESXi workload just as you did before but now rather than having to configure individual vNICs on your Nested ESXi VM to benefit from MAC Learning, you simply just place your Nested ESXi VMs on the Distributed Virtual Portgroups that have MAC Learning enabled, pretty easy right!? In addition to adding the Learnswitch VMkernel module when installing the VIB, it also includes a really handy net-learnswitch command-line utility. Another useful command is to dump out the entire MAC Address table and this is where you could identify aged MAC Addresses(s) that should be removed. For a complete list of options with the net-learnswitch CLI, you can specify the -h command. Lastly, I would like to give a big shoutout to Subin Mathew who has been the lead developer behind the Learnswitch. Thanks for all the awesome work you have done to help further improve running Nested ESXi, even if it is still not "officially" supported :D. Also, a huge thanks to Christian Dickmann who initially started this effort with the MAC Learn dvFilter, our customers truly appreciate it as do all of us who run Nested ESXi for lab and educational purposes. Awesome stuff. We hope to use this in the near future. 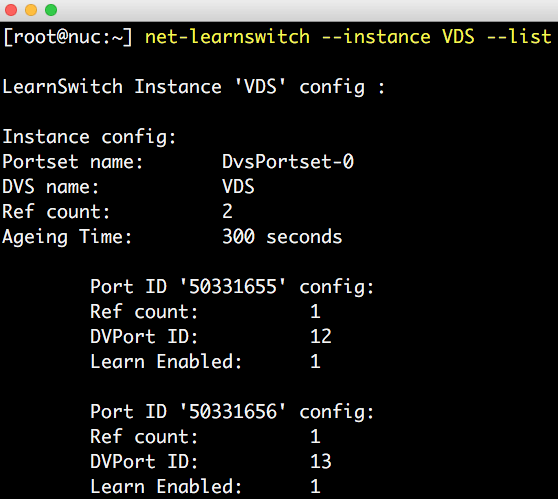 Small typo: net-learnswitch --instasnce VDS --stats (should be instance). Should help the copy/pasters! If you run NSX on the top level ESXi would checking the option Enable MAC learning achieve the same outcome for the dvportgroup? What I need to check in order to fix it? You need to move to Python 2.7.9 or above. Can you please explain more how we can enable the python-six and yaml packages so the script can work. I too am experiencing problems with the script as I don’t know Python, and I’m using Windows. Is there a PowerCLI version of the script or a tutorual on how ot install/setup the two additional pieces (six, yaml)? Or, is there some explanation of what the script does in generic terms so that I could write something myself? There was enough detail in the Learn dvFilter to be able write something myself. Please unzip VMware-pyVpx-6.5.0-4602587.zip and put the learnswitch_cfg.py file inside newly created pyVpx directory and run from there. That worked for me. I think shall be explicitly written in the description above. Are “aged” mac addresses automatically removed? Also, when a portgroup is deleted are the corresponding mac address entries removed? I’m running into the issues that you’d described in some of your earlier posts about using the promiscuous mode setting on the portgroup and seeing duplication of packets being sent to all VMs. I’m thinking that the Learnswitch might be the answer to my problems but thought I’d run it by you before I went down that path. Anyway, I appreciate any help you can provide. I belive it has a bug when PG is trunk. It doesn’t learn mac address from uplink port. on remote computer I see arp entry. 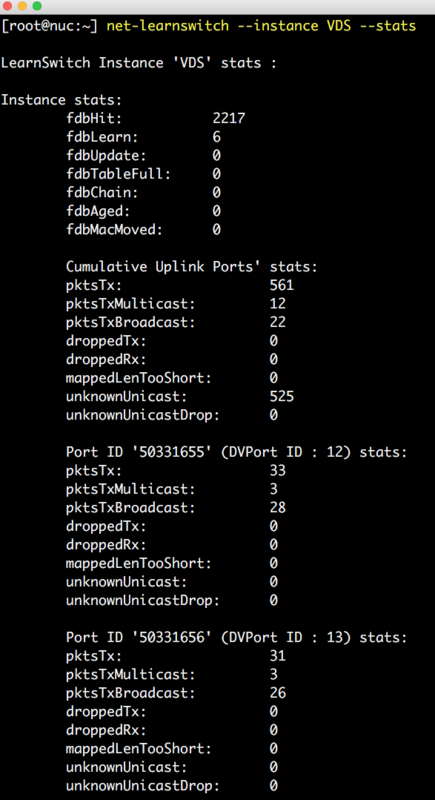 So Nested VM tagged packet move out but on ingress on uplink switch doesn’t learn macs’. I switch PG back to a trunk since nested still tagg with 30/10 and switch has right table it works. i’m trying to understand the use cases of MAC LEARNING option when implementing a LS on NSX. And when you say : MAC Address learning is based on VLAN ID or VXLAN ID on uplink and leaf port. what VLAN are we talkng about ?